If you had asked me my opinion on The Salty Pig, a little restaurant in the heart of Boston's Back Bay district, I would have said many things. I would have said that I love the ambiance with its clean tile, chalkboards and tin sconces. I would have said that I think its the perfect place to catch up with friends over glasses of wine. I would have said that its a great place to warm up in front of their wood burning oven on a cold night. I would not, however, have said I loved their food. Visits had always left me reaching for glass upon glass of water due to over salting, that is, until tonight. One evening last week, as I sat perched at my table filled with other food writer types, I loved every course more than the one before it, and reached for my water glass only to cleanse my palate. The difference, as it often does, lies in the chef. Just back from a stint in Paris, Rhode Island Native Chef Kevin O'Donnell took the helm at Salty Pig just a few months ago and is now shaking things up and creating a name for himself and the restaurant. We were invited in to check out what will be their "chefs table" a cozy section of the restaurant that sits over looking the wood fired oven and a chef station where a tasting menu will be offered. We were treated to a sampling of dishes that may appear on that menu. 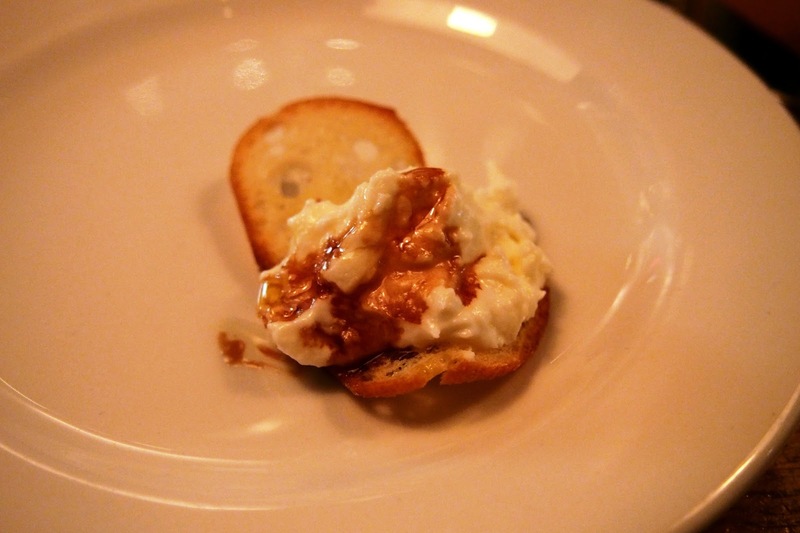 We began our tasting with crostini topped with a pulled curd cheese and a drizzle of balsamic vinegar. As far as first bites are concerned- this was a wonderful awaken er for our taste buds- fresh soft, salty cheese topping a buttery crisp toast and then finished with a rich sweet and tangy balsamic. Every flavored played off of each other with compliments, the salt to the tang, the butter to the sweet and the textural contrasts of the soft cheese to the crisp toast made this a perfect start to our meal. Next dish to arrive at our table was a toasty fried ravioli, wrapped in Prosciutto, and topped with a thin shaving of pungent salty cheese. Here again, we were delighted by a great pairing of both flavors and textures. 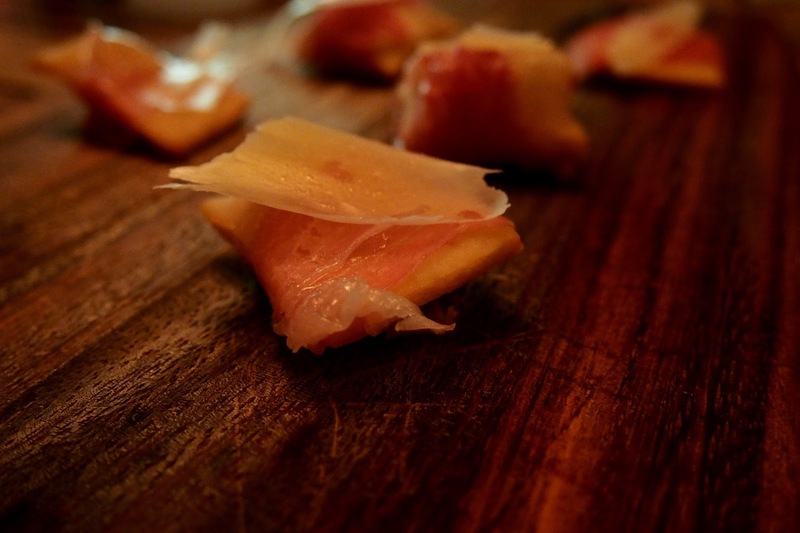 The crispness gave way to soft interior of creamy ricotta, the Prosciutto added that decadent yet hearty feeling. We had a bit of a fight over the last few of these wonderful little bites- they were very quick to disappear. 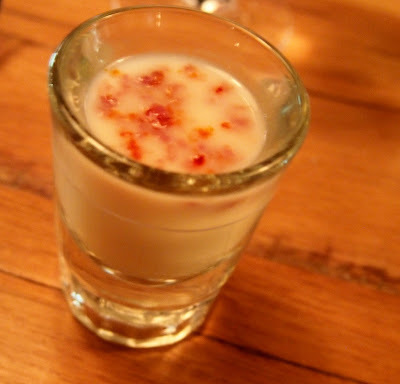 Just as we finished those ravioli, shot glasses full of hot potato and Swiss soup topped with shaved chorizo were set in front of us. I loved this soup and would have enjoyed a giant bowl of it. The potato was pureed with the swiss cheese into a thick, creamy base, full of earthy flavor from the potato and lightened with the nutty cheese flavor. The really special angle here was the shaved chorizo- spicy and and perfect with the creamy soup. Rounding out our small bites for the evenings, they brought us their own head cheese, a lovely blend with cherries, apples, grain mustard, red wine and fruit mostarda. The combination of these flavors were lovely, a little spice, great sweetness from the fruit, a richness from the wine. This was a lovely bite. 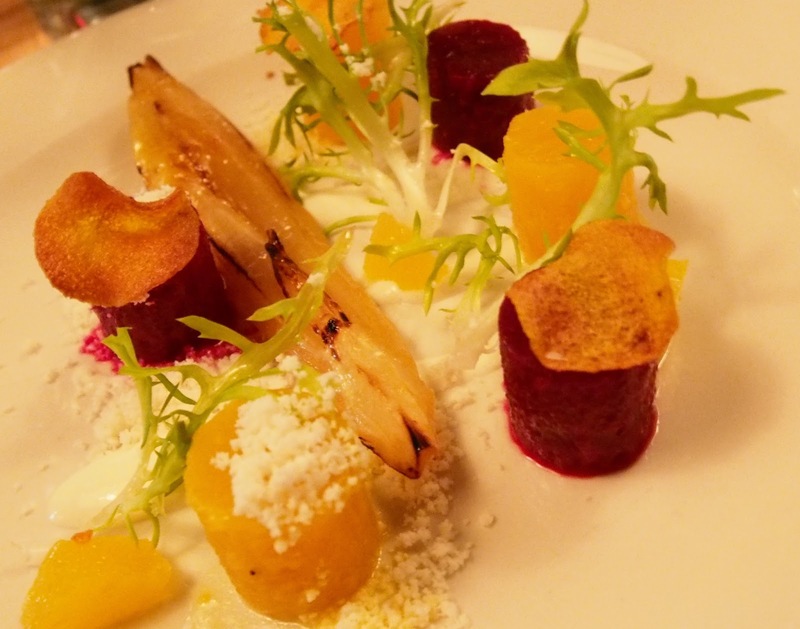 Our first course of our meal was an artfully designed roasted beet salad topped with beat chips, frisee, citrus segments, and feta cheese. Beets have such a particular flavor. It took me a very long time to fully accept these root vegetables into my diet, but now I realize how they must be appreciated for their unique flavor, especially when paired correctly. Here it was a wonderful mix of slightly bitter frisee, salty feta and wonderfully juicy citrus. I loved the addition of the citrus- it added a unique twist that freshened the starchy vegetables. 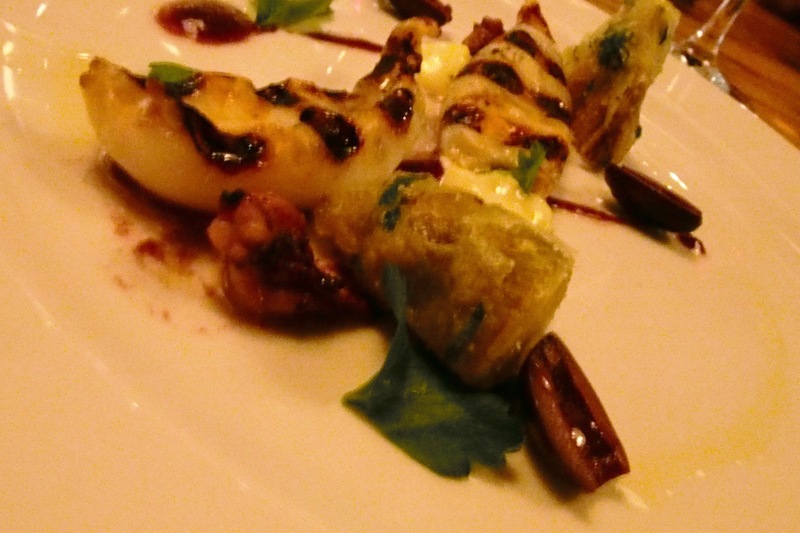 Chef presented our next dish and we knew immediately that this was one of his favorites. Wanting to bring his home of Rhode Island into a dish, but putting his own unique twist on it, he grilled the beautiful tubes of calamari so they were smokey and tender. These were dressed with a Myer Lemon aioli, and a kalamata olive vinaigrette which together rounded out the smoke with bright lemon, cream and a salty offset. I loved everything about this dish. Each component added something different, and each combined together created a harmonious bite. As I finished off the calamari, I felt quite certain that nothing could be better. 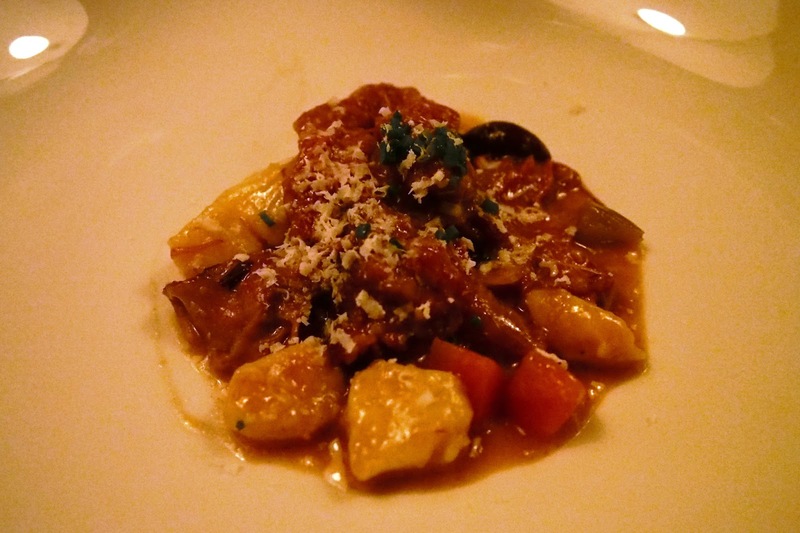 I set myself up assuming that the next dishes wouldn't measure to the calamari- and then a piping hot bowl of ever so light, pillowy gnocchi dressed with rich lamb neck and root vegetable sauce. The gnocchi themselves were impossibly light, creamy and the perfect vehicle for the tender lamb. The sauce was deep and rich, but was brightened with the zest of an orange. The contrast of the citrus with what could have been a very heavy, dense dish was incredibly welcome and elevated this far beyond even a "good" gnocchi dish. 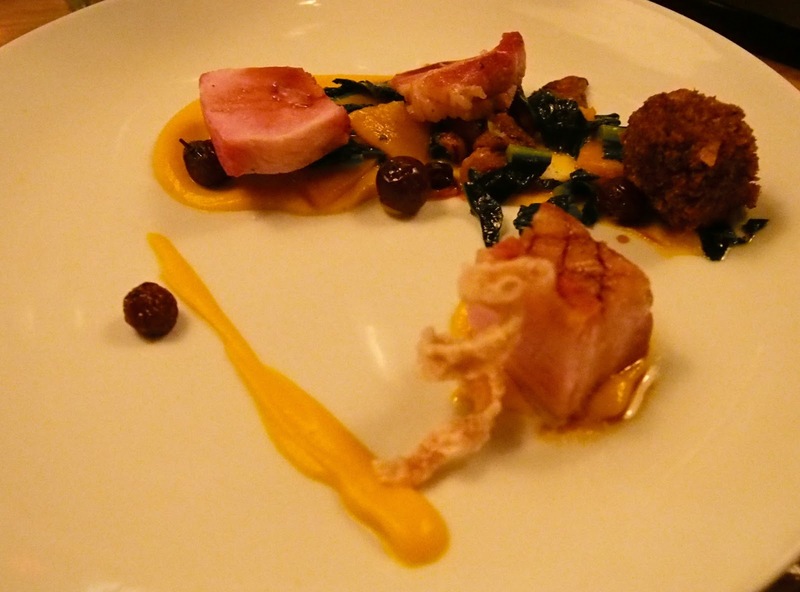 In celebration of the pig, which O'Donnell breaks down one of in house in each week, he presented us next with a plate of different parts of the pig, paired with silky smear of butternut squash. Rich pork belly, fried orbs, smokey ham....each component of the pig was artfully prepared and bursting with flavor. It was a simple plated dish which allowed the different components to each stand on their own. I think it's very safe to say, after thoroughly enjoying every piece of this dish, that Chef O'Donnell knows his way around a pig- which is a very good thing at a restaurant named The Salty Pig. 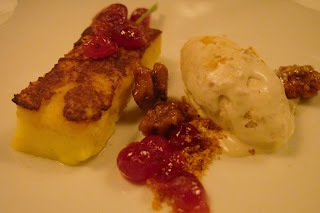 We finished our meal with a vanilla bread pudding, bedecked with maple walnut ice cream and bursting cranberries. Once again, O'Donnell created a well rounded dish countering the sweetness of the pudding and the ice cream with the tart berries. The pudding itself was well prepared, creamy and sweet without being overly so, and warmed through. While it may not have been the most elaborate dessert, it was comforting and provided just the right amount of sweetness at the end of a savory meal. This visit to The Salty Pig puts it in a whole different category for me. No more will I regard it as simply a place to stop into to have a quick drink on my way somewhere else. No more will I frown when someone mentions eating there. No more will I consider how much water Ill need to drink after a meal there. 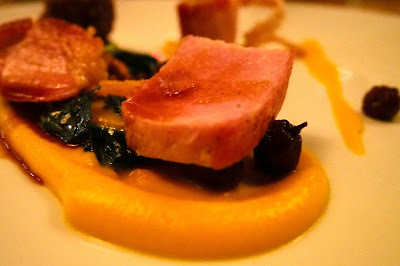 Now I know- The Salty Pig, under Chef O'Donnell, is creating inventive dishes, full of true flavors and delicious pairings. The staff is as warm and accommodating as always and with reasonable prices, The Salty Pig is a don't miss.